Sold by SOUTHWEST MEDIA and ships from Amazon Fulfillment. Sold by Goods for Days and ships from Amazon Fulfillment. All 24 Episodes From Season Five! 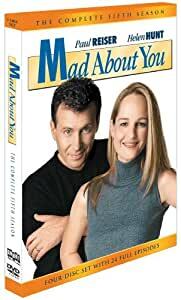 Emmy Award winning Paul Reiser and Helen Hunt are back at it again in the fifth season of Mad About You. Having nearly separated after Jamie (Hunt) and Paul (Reiser) each admit to a close call with infidelity, the Buchmans start their fifth year of marriage with the news that they are going to have a little tiny baby! But of course it will not be easy. While Jamie continues working at her new PR firm, Paul is unemployed after losing his job at the Explorer Channel. From searching for a decent doctor for Jamie and seeing a marriage counselor to childbirth classes and Pauls new film, the Buchmans are in for a rocky pregnancy at the very least. Guest stars include Carol Burnett and Mel Brooks, who would both go on to win Emmys for their performances. Nothing can ever match the perfection that is the first three seasons of this series, as they were the pinnacle of masterful writing, comic timing and a heartwarming reflection of the truths that reside within every couple's relationship. I felt the season took a major downward turn once season 4 began (& onward), so I watched very little of it when it aired on TV & instead chose to hold the first three seasons warm in my memory. It was only in recent years that I felt I wanted closure on how they wrapped-up the series, so I watched all the remaining seasons. Refer back to the first sentence of this review & then to the title, and that about sums it up. 5.0 out of 5 starsA Wonderfully Funny TV Series! I loved this comedy in the time of its original heyday, and I now enjoy so much, the comedy of each of the characters on this show. "Mad About You" is one of those shows where you wish that all the characters were someone in your family, or living in your neighborhood, or working with you - they are so real, funny and relatable. Even Murray the dog is a funny character - you just want to love him to pieces! Each episode of this season are great, culminating of course with Paul and Jamie having the baby. "Mad About You" is comedy at its best, the kind of comedy that somehow can't be found too much these days. I enjoy watching each season as it comes out, tremendously. My only complaint and regret is that it takes so very long for the seasons to come out! I don't know why that is, but please, put a rush on the next seasons because this is such a great show and should be available for purchase to the many people who I'm sure want to watch. 2.0 out of 5 starsVERY disappointing editing! I'm very disappointed that these are not complete episodes. For example, episode 4, "The Clip Show" has a scene before the credits where Jamie is sleeping and Paul is explaining baseball to the baby. That is not in this compilation. Several opening scenes and other scenes are missing. When you shell out money for tv episodes, you do expect to get the WHOLE episodes, but that's not what we get here. Loved this show when it was on the air, and was glad a year or two ago to see DVDs for some of the seasons, and like many people, was frustrated when it seemed like we'd never get 5, 6, or 7. I was very happy when season 5 came out, since in my opinion season 4 was the worst of them all (but still decent). I hated that my collection ended with that low point in the series life. Season 5 is where it started getting good again. Quality is good, no problems with sound or video anywhere on any of the discs. I have captures of seasons 6 and 7 but not great quality, so now I'm just waiting for the next DVD's to some out. At least there's word that it won't be as long between now! 5.0 out of 5 starsGood Adult comedy..
Good show!! Upgraded to the box set..They finally have a baby and bruce willis guest stars in this season!! Great to finally have this on DVD. The picture quality isn't the greatest and there's not a whole lot o' special features; however, it's a must for Mad About You fans. Packaging was great, DVD's worked fine, and it was shipped promptly. I can't wait to get the final seasons to complete my collection. 5.0 out of 5 starsWonderful, Beautiful, Marvelous! Okay, the praises are a bit over stated... or are they? The fact of the matter is, this is one of the best series ever produced. Why? First, intelligent dialogue that might actually happen. Consistent throughout series! Second, wonderfully cast roles. Seriously. The casting director deserves an Emmy. Third, generous attention to details. Nuanced performances. Fourth, actually filmed in NY, unlike that 'other' series - you know the one. Sixth, growth in characters. How often is this aspect not included? Too often! Seventh, you care about these people, truly care. How rare is that? Expecting the release of the final two seasons by what? 2013 maybe? We hope. And then the Blu Ray will inevitably come. There was criticism in Season 5's video. I didn't experience the blotchy thing they spoke of (which happens on digital with fast actions, quick motions). I would notice, too, since I am a photographer and artist. The 'extras' were, as has been the case with this series, skimpy. But I don't really need commentaries and interviews (a few are included throughout). Sometimes a show can just stand on its own without comment. This one does. It's all there, if you're paying attention. Mad About You is one of the funniest shows of the 90's and the fifth season was one of their best. I want to say that this set is worth the price because it is a show unlike any other. I am very satisfied with this purchase. It is a good show for people that love to laugh at everyday occurrences or that are nostalgic for the simplicity of a 90's sitcom. Helen Hunt especially steals the show as Jamie, the wife on the series.